Despite my bad experience, I’m still a huge supporter of packers and all the good things they do in the Sierra Nevada. I planned three resupplies during my thru-hike: one at Red’s Meadow, one at Muir Trail Ranch, and one at Woods Creek. I mailed a box or bucket ahead for all three. The box for Woods Creek was to be brought in by a packer. I actually had decided, twice, not to use a packer. About a month before my trip I was still the only person looking for supplies to be delivered on the day I wanted, which meant that I would have to shoulder the entire $600 fee. When I called to cancel the request I was told that another hiker had “just signed up” for the same day. With two hikers the fee was now $300; that is still steep, but a little more manageable. A couple of days later, when I called to make final coordination, I was told that I could not get the package at Rae Lakes, where I wanted it, but instead I would have to meet the packer at Woods Creek. That was fine with me, but if we were going to meet at Woods Creek there would be one stipulation: it would have to be at midday—not late afternoon. He told me that noon would be hard to do. I was having second thoughts about the whole idea, again, for a second time, and I told him that my preference would be to cancel the delivery. He reconsidered, and he said he would be willing to “leave early” in order to meet my schedule. It seemed he really needed the work, so I agreed. The next day I sent my resupply box and my check for $300. You have probably figured out the rest of the story. I arrived at Woods Creek at about 11:55 a.m. on the designated date. There were no packers at noon, no packers at 1 p.m., no packers at 2 p.m., and no packers at 3 p.m., when I left. Another couple, who arrived at Woods Creek as I was leaving, and who caught up with me two days later, told me that packers never arrived that day. I’m no equestrian, but even I know that one should not expect someone on horseback to arrive at a scheduled time with the dependability of a train at a station. So, when I called the outfit after I had returned home I was prepared to accept that something unforeseen had occurred. What I wasn’t prepared for was the nonsense I heard when I telephoned. First, I got the “We just missed you by five minutes…” excuse. I knew for a fact that wasn’t true. Then I got the, “We never promised you noon…” excuse. That was particularly annoying, since I would have never booked the service if I hadn’t been told that they COULD make it by noon, and that they would leave early in order to do so. Also, it didn’t really explain why they hadn’t shown up at all on the agreed upon day. First, even after this major annoyance, I am not anti-packer. I know they play a major, positive, role in the Sierra Nevada. I’m also willing to take my share of the blame for this incident. I would have been far better off rearranging my hike plan in order to spend the night at Wood’s Creek, thus increasing the window of opportunity to twelve hours or more, instead of the three hours I allotted. That said, if you are going to take my money and tell me you are going to deliver my supplies, unless something truly catastrophic happens, you darned well ought to do it. That brings me to my final piece of advice: if you are going to use a packer then get everything in writing. If the packer is unwilling to communicate with email (it’s interesting that the one I used “doesn’t do” email), then use US Mail. I was able to continue my hike, and finish it, without my final resupply. I owe that to a couple of generous hikers who had brought some extra food. UPDATE: A number of commenters have requested that I name the packers I dealt with this summer. That’s a perfectly reasonable request, but I’ve decided not to do so for a couple of reasons. First, my experience was just that–one experience. I get the impression that all of these packing operations are hanging by a thread, and I don’t want one bad situation to cause anyone to go under. Second, the moment I name the outfit a bunch of folks are going to respond that they had a GREAT experience with them. I’m sure that’s true, but that doesn’t really change anything that I’ve written above, or change any conclusions that I might make. As they say, the plural of anecdote is not data. My bottom line remains the same: by getting the agreement in writing there should be no confusion on either party’s part on what the expectations are. Hey Ray, good to hear you ended up able to finish without the resupply… I’m putting together a list of JMT packers right now, would rather leave them off the list… can you email me (or comment here if you want) the name of the outfit? Thanks for the comment, Mike. Please see my update, above, regarding naming the company. Yes. Please let us know who it is do we can avoid these jokers! They give everyone else a bad name! Thanks, John. I am reluctant to name names for the reasons I state, above, in my update. I would also like to know the name of the packer. In August five of us combined for a packer delivery (Cedar Grove Pack Station, coming from the west side) at Woods Creek. Because there were five of us, the cost was only $125 each. I bailed out of the trip before Woods Creek, but all of the others completed their hike. 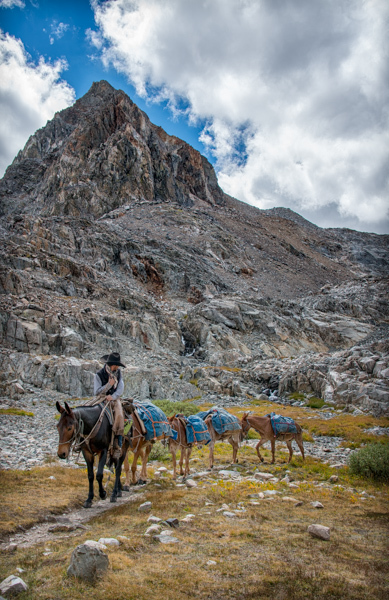 The packer (who used mules, not horses) told us in advance that they would be there late afternoon. They showed up right when they were supposed to. They also had been extremely helpful and accommodating in phone conversations in advance of our trip (they don’t do email either, and I had nothing in writing, but it didn’t matter). After the trip I did not ask for a refund of my $125 because in fact they’d made the trip to Woods Creek – returning my money would have been a loss for them. But, unexpectedly, one morning I found a check for a full refund in the mail, minus only the cost of postage to return my box to me. I recommend Cedar Grove Pack Station. Thanks, Gail. It’s always great to see your name pop up in the comments. I’m glad your resupply went well! Nevertheless, I still think that “getting it in writing” is a good idea. First, the thing I really appreciate about your blog is the honesty. You tell it like it is….and you do so fairly, without letting emotions get in the way. I appreciate that. Second, having a husband who is an attorney has taught me that getting it in writing is invaluable, so your advice is spot-on. Not only does it protect you, but it makes sure that there are no misunderstandings, hopefully avoiding the problem from occurring in the first place. Isn’t that what we really want? Even good companies can have bad employees, or miscommunications. Having everything in writing helps prevent this to start with, and ensures everyone is in agreement, and gives you recourse if something does go wrong. When something as important as food is at stake, it can mean the difference between finishing and bailing. Great advice as always, and thanks for the article! Thanks, Kathy. You hit the nail on the head. Writing things downs just makes sense. You didn’t mention what the nature of your refund was, which could make a substantial impact on the conclusion a reader might make. Happy holidays to you and your family. Great question, Fred. No refund, just a good lesson. I hate to admit it, but a $300 mistake doesn’t even make the top ten of my adult life! If you’re not planning to do so already, a blog entry on the situations and folks who helped you through the food shortage, would be interesting reading. I would not allow some two-bit operation to steal $300 from me. I would have paid them a visit. If they will do it to one person, they likely have and WILL do it to more. A reputable operation would have refunded your money if they screwed up. Obsfucation doesnt serve the purpose here you think it does. Thanks for the comment, Mike. You say that if they were reputable the “would have refunded your money if they screwed up.” I guess that’s my point; they didn’t think they screwed up, they thought everyone went as we discussed. That’s why I suggest setting things out clearly, in writing. It’s no cure all, but it should help! well, things obviously didnt, and you had witnesses to that effect. Possibly an employee screwed up, and just wanted to paper things over. Who knows. But as it stood they were guilty of wire fraud, a federal offense. Refunding your $300 compared to fighting federal charges would be a no-brainer. Should have had a lawyer send a letter. Ray, are you able to pinpoint all the Packers that are licensed to service that point. I’m thinking there are between 3-4 packers that can handle that location. It would be nice to name the full slew of them. 3. Kearsarge Pass/JMT Junctions (this I believe is easy as only Sequoia Kings Pack Train (a Berner pack company) I think is licensed here). Getting a comprehensive list is a good idea. Perhaps I’ll include that in the next edition! Thanks, Roleigh. on my first JMT hike had arranged resupply at Kearsarge Pass with East Side Sierra Shuttle. True! Thanks for comment, Hamish. However, we do resupply services at several destinations. Thanks, Danica. To be honest I don’t remember who it was I dealt with, although I do remember that it was not you. That said, my advice still stands: get at least an email exchange between packer and hiker describing EXACTLY what the expectations are so that there isn’t disappointment later. Appreciate the comment! Had a similar experience with Sequoia Kings Pack Trains; we were first limited with scheduling when we could pick up the resupply and raced to get there in time only to find that our resupply was not there. The packer was there with someone else’s supply. We also received several excuses after the fact for why our resupply was not there. Have heard several stories of issues with Sequoia Kings Pack Trains. Suggest using Mt Williamson Hotel for resupply to this area. This could have been an incredibly dangerous situation as we would not have had enough food to even hike out, but thanks to the kindness of strangers and the packer hunting down our box, we were able to get to our supply 2 days later to finish the trail. Thanks, SV. These things do not always go as planned and I think it happens more often than people think. Appreciate the comment.